Schneider Electric is the global specialist in energy management and automation. Their Modicon M580 Ethernet Programmable Automation Controller (ePAC) is the flagship product of the Modicon controller range. Designed for applications requiring extreme data reliability and speed, Everspin’s 16-Megabit MR4A16BMA35 MRAM benefits system designers with the fastest non-volatile memory on the market, symmetrical read/write performance and unlimited endurance. These memory features ensure automation designers that process data is retained deterministically and safely every time a power interruption occurs. In addition to the performance, the technology also allows a battery free eco-design. Smart power meters require data-logging for energy management and billing., plus enhanced reliability for long-life in harsh environments. In addition, data retention over long periods of time is needed so that utility companies can monitor usage patterns or take advantage of time-of-use rate structures. Smart Meter manufacturers are beginning to adopt MRAM for on-site data retention. This is true because twenty year data retention over the entire operating temperature range means MRAM memory can be relied upon for critical data storage, without back up by battery. Should power fail, data is not lost and the memory will fully recover when power is restored. Utility companies can provide a dynamic security feature in which security keys and codes are updated or erased remotely. Detection of tampering using high-strength magnetic fields is possible with MRAM. 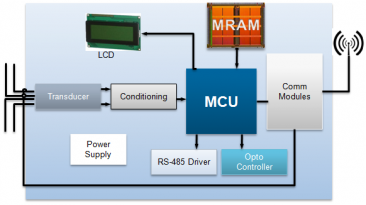 Radio and Microelectronics (RIM) has recently selected an Everspin 4Mb Serial SPI MRAM for use in their RIM789 Smart Meter. RIM 3-phase smart meters are GOST 52320-2005 certified in Russia, specified to deploy for 30 years in harsh environments, and feature self-diagnosis and resistance to climatic, mechanical and electromagnetic influences.